It’s a simple yet excruciating irony that in a natural disaster that dumps more than 50 inches of rain on a single region, water becomes widely unavailable for consumption — for either people to drink or factories to function — even as it floods scores of neighborhoods. So it’s no surprise that water, and the havoc it continues to wreak in Houston and other areas, is central to the issue of supply chain risk management in the wake of Hurricane Harvey. Spend Matters has been covering the hurricane (see related stories below), which had been downgraded to a tropical storm soon after, and the disaster spurred a recent webinar presented by Resilinc, a supply chain resiliency solutions provider. Using data gathered by the provider’s technology platform, Resilinc CEO Bindiya Vakil made a stark point about how big a role water plays in the disruption of suppliers’ and other key supply chain facilities’ sites. 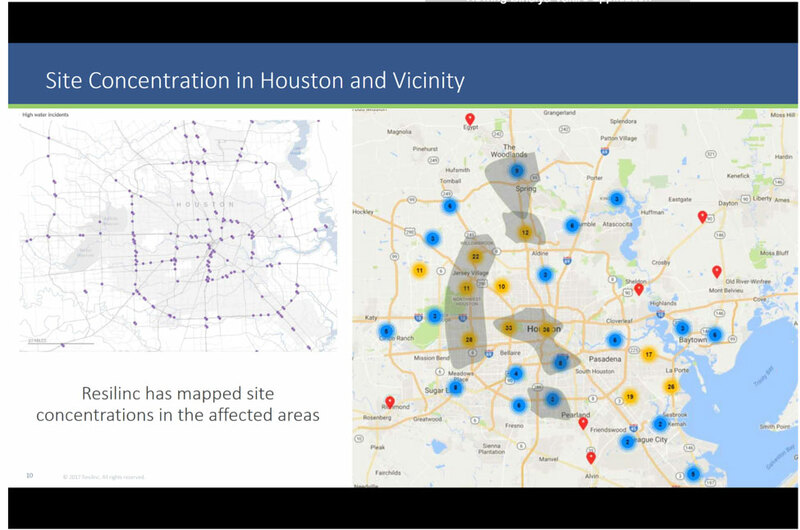 “As you overlay the road closures, and look at it next to the sites and site concentrations mapped by color, you can see that we’re looking at a pretty concerning situation,” Vakil said. The biggest takeaway is another relatively simple one. If roads leading up to a plant site are flooding, it usually results in one to four weeks, on average, of disruption. But if the factory is itself flooded, that’s equals a much longer period of disruption — to the tune of three to six months. “We can expect that if factories have [any sort of] water dependency, there’s going to be extended disruption,” Vakil said. “Even if your suppliers are telling you they’re experiencing minimal impact, their essential infrastructure may not be available.” Equipment, for example, may not only need to be replaced, but depending on the complexity and specific qualifications of the products, manufacturers may need to consider test runs for QC purposes, among other steps. Resilinc gathers what it calls recovery time metrics, which takes alternate sites of supply available and other factors into account. 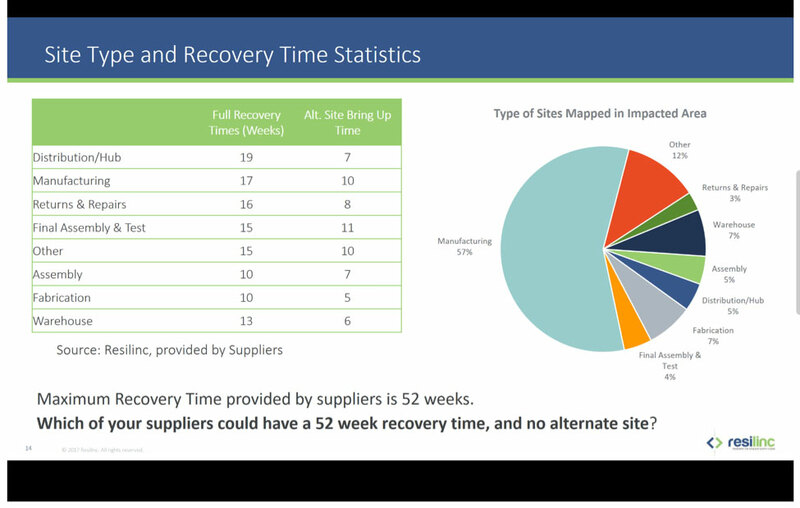 Ultimately, for industry across the board on average, supply chain professionals should be looking at a quarter or two at minimum of full recovery time, according to Vakil. Resilinc has had its ear to the ground since August 24, according to the presenters, and upon reaching out to their supplier network, has gathering an interesting snapshot of intelligence. For example, out of 800 supplier sites, some 400 unique sites had been contacted, and about 40% of suppliers responded. Overall, based on the responses, Resilinc has determined an average of one to four weeks of confirmed impact on these suppliers. As riskmethods’ Heiko Schwarz and Bill DeMartino had told Spend Matters in an earlier report, so many suppliers were so busy scrambling amidst relief efforts that they had a hard time simply responding to inquiries, which in turn hobbled buying organizations’ assessments of full impact. By now, however, Resilinc’s Vakil and Joe Carson, the firm’s chief strategy officer, maintain that companies should have heard from their suppliers and their status. “Trust but verify” should be a key mantra in these stages. At the very least, attempts to verify what your suppliers are telling you is essential, according to Carson. “Positive answers,” from suppliers, many of whom would hate to let down their customer, “may not have basis in fact,” said Carson. One of the best things procurement and supply chain professionals can do in situations such as these is to educate themselves — specifically being able to drill down deep to gain sub-tier levels of visibility for sourced materials. Take the chemical industry. According to the Dallas Morning News, 33% of total U.S. chemical production has been disrupted. Professionals should not only be thinking about their suppliers in the area, but also peeling back the onion several layers downstream, all the way down to the chemical elements. “You may need to dig deeper in your understanding — knowing all your ingredients, for example — than what your supplier is willing or able to provide you,” Carson said. With 68 different chemicals mapped to Texas manufacturing sites that feed multiple industries, and companies from Dupont to BASF to Arkema dotting the region’s landscape, this type of granular intelligence becomes crucial for buying organizations. Another worthwhile approach, while it may sound simple, is to think through the types of meetings to have before and during a disruptive event and defining various parties’ roles and responsibilities. (What is the agenda? Who should be present?) Establishing a disruption management team and fostering the correct channels as a direct line to corporate risk councils is key, according to Carson. Ultimately, getting buy-in to make critical decisions (e.g., a quick material purchase absent any demand forecasts) from company leaders in times of disruption could streamline the disaster response for procurement and supply chain professionals. Which brings us to the final point: Don’t forget that time is indeed of the essence. Having the shortlist of the right questions to answer when assessing the situation (“Upstream/downstream dependencies? Single-sourced components? Alternate sources or transport routes identified?”) will expedite the determination of which teams to involve and which actions to consider, such as freight forwarding or moving supply out of the region. With total potential economic cost estimates of the Hurricane Harvey disaster ranging from $11 billion up to $100 billion, it pays for procurement practitioners to be as prepared as possible.